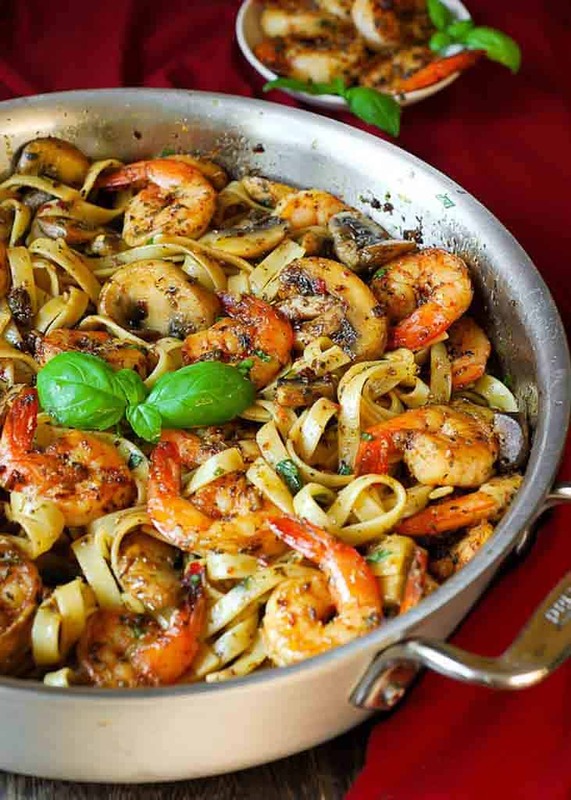 Pesto Shrimp Pasta - What's In The Pan? Perfect for busy weeknights, family dinners, or even date nights, this Pesto Shrimp Pasta comes together quickly and is guaranteed to become a favorite! Easy one pot pasta dish that is ready in about 20 minutes! 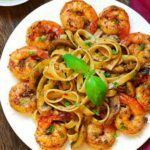 The delicious Pesto Shrimp Fettuccine in White Wine Sauce is all about the flavor combination of zesty pesto, white wine, garlic, pasta and mushrooms. The best part is the perfectly cooked shrimp that is packed with flavor! Easy and delicious shrimp pasta in just 30 minutes! Do you ever find yourself constantly whipping up pasta because not only is it delicious, but also convenient to prepare and requires little effort? The exact same goes for shrimp. Pair the two together in this easy pesto shrimp fettuccine pasta and you have a luxurious tasting meal that comes together at a moment’s notice. For this pasta and shrimp combo, I’ve gone with a pesto shrimp because shrimp and pesto complement each other both in taste and texture. After making this shrimp fettuccine, I decided that both fettuccine, pesto and shrimp should become a weekly thing for us because it’s one of the best tasting shrimp pastas I’ve had. The pasta here turned out to have an appetizingly warm color, not the usual greenish “pesto tint” since we only used 1/3 cup pesto and plenty of liquids, including white wine to offset the “green”. 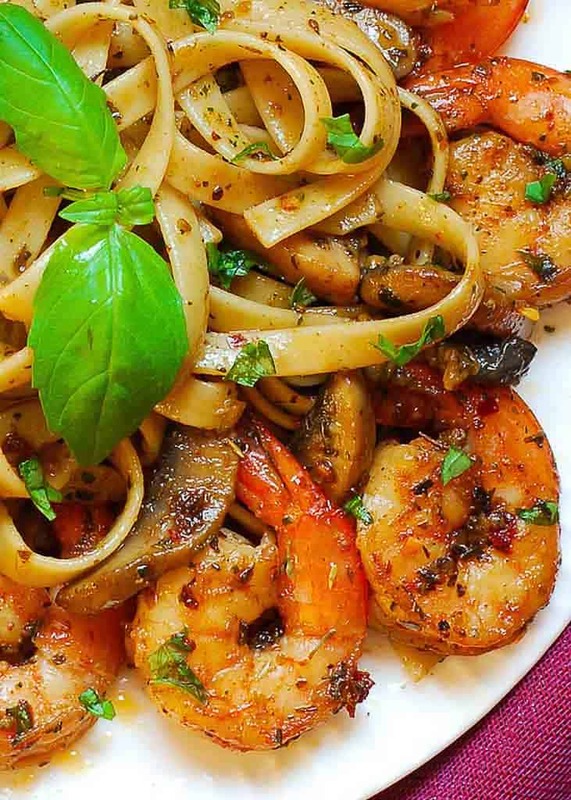 Based on the reader reviews, you can go even lower on pesto (1/4 cup) and still get a great taste out of this shrimp and mushroom fettuccine dish! I was never a fan of “green” pesto recipes, especially when it comes to pasta. Who likes green pasta anyways? 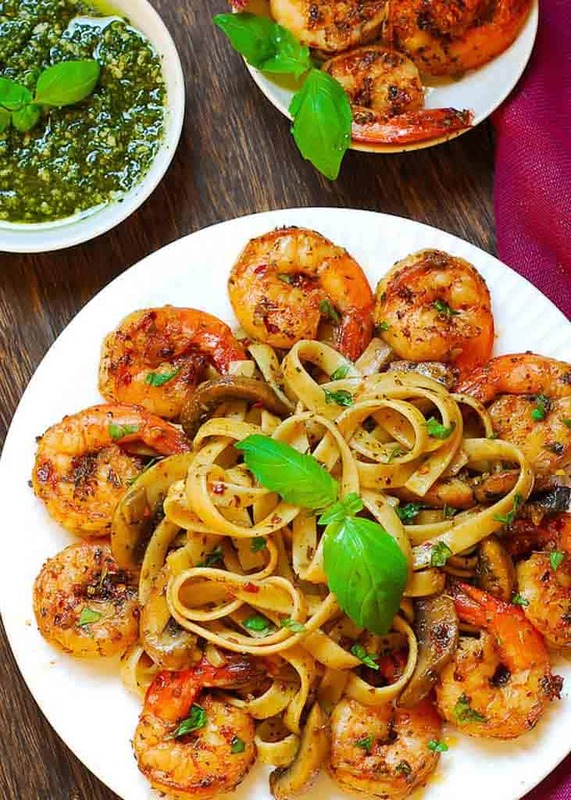 This pesto shrimp fettuccine also doesn’t leave you with a leafy grassy flavor from the basil, instead you get perfect balance of taste and color. Put shrimp in a mixing bowl and rub in seasoning mixture. Mix well to make sure shrimp is coated well. Heat 1 tablespoon of olive oil in a large skillet over medium heat. Add shrimp to the hot pan and cook for about 3 minutes, turning once midway, until shrimp is pink and cooked through. 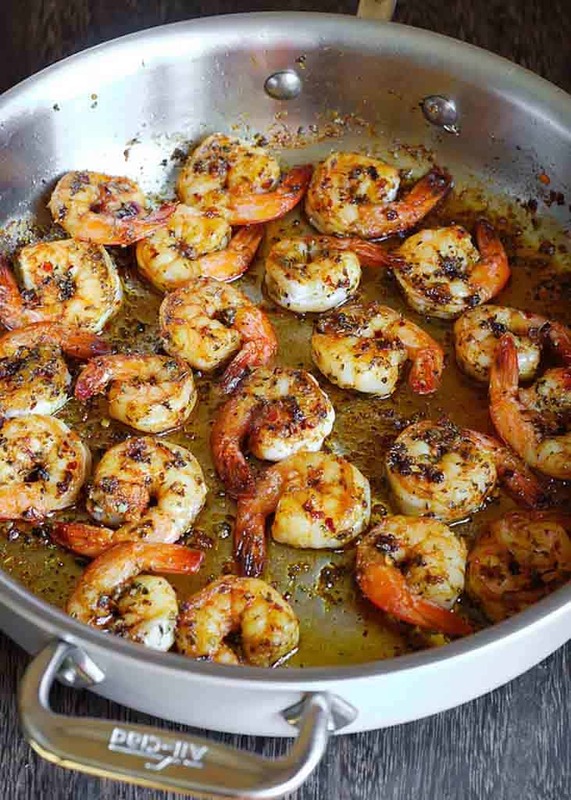 Cooking Tip: Make sure to heat the stainless steel pan before adding the oil – then add the shrimp. Steel expands when hot and contracts when it comes into contact with a cooler temperature, which is why foods stick to the surface if the surface is cold. By adding oil to the pan when it’s hot, the steel becomes static, resulting in a temporarily nonstick surface! The key to successfully cooking shrimp is to not overcook it. If you cook shrimp for too long it will get tough. Shrimp cooks quickly and as soon as the flesh changes from opalescence to opaque, they’re done. It should be only 2 or 3 minutes depending on the size. Once you cook it, remove shrimp from the skillet. Perfectly cooked mushrooms is the essential parts to this Pesto Shrimp Fettuccine dish. Heat is what gives you browning for the mushrooms as well as using plenty of oil to help quickly evaporate any water that mushrooms will sweat out. All you have to do to cook them right is use the large and hot pan, don’t overcrowd it, add a bit of salt to the mushrooms and resist the urge to move them too soon. You want to get a little browning on the mushrooms by cooking them undisturbed for about 2 minutes. Add minced garlic for the last few minutes, when mushrooms are almost ready. Now it’s time to add cooked shrimp that we removed earlier back into the pan. Add basil pesto, deglaze with wine and add chicken broth. On medium heat, mix everything to combine and reheat the shrimp. Remove from heat. Use any dry white wine that you would normally drink. I used Pinot Grigio. Other good options include Chardonnay or Sauvignon Blanc. Do not use cooking wine (unless you want to ruin the pleasure of eating Pesto Shrimp Fettuccine). You won’t need much – only enough to deglaze when adding pesto. I used 1/4 cup of wine. You can use up to 1/2 cup. Now bring a large pot of water to boil, add pasta and cook it according to instructions. Drain fettuccine, but do not rinse. This step can also be done ahead of time but I like my pasta fresh. Add fettuccine to the skillet with mushrooms and shrimp, and stir until pasta is fully coated in sauce. Reheat well on low heat (you can also cover the pan with the lid to retain the heat). Done! Now you are ready to dive into this Pesto Shrimp Fettuccine that tastes every bit as delicious as the finest seafood restaurant. This delicious Pesto Shrimp Pasta is all about the flavor combination of zesty pesto, wine, garlic and mushrooms. Heat 1 tablespoon of olive oil in a large skillet over medium heat. Put shrimp in a mixing bowl and rub in seasoning mixture. Mix well to make sure shrimp is coated well. Add to the hot pan and cook for about 2-3 minutes on each side, turning once midway, until shrimp is pink and cooked through. 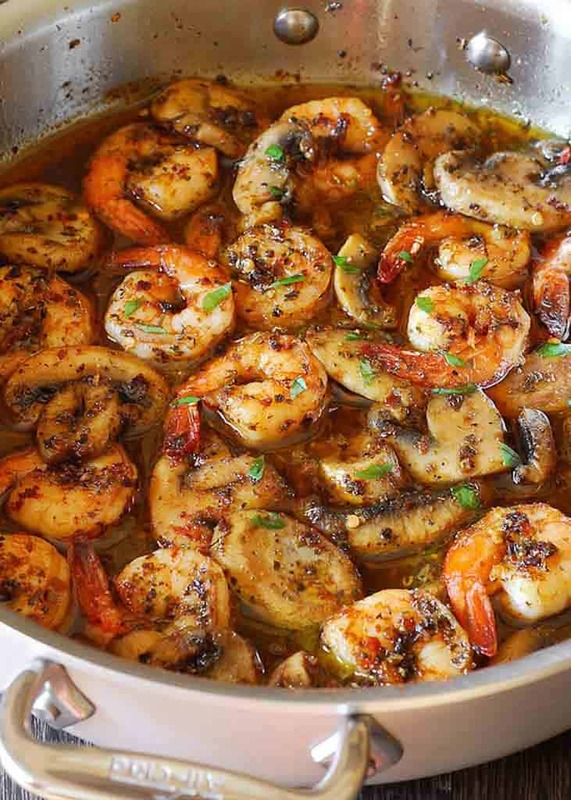 Remove shrimp from the skillet. Add second tablespoon of olive oil to the skillet. 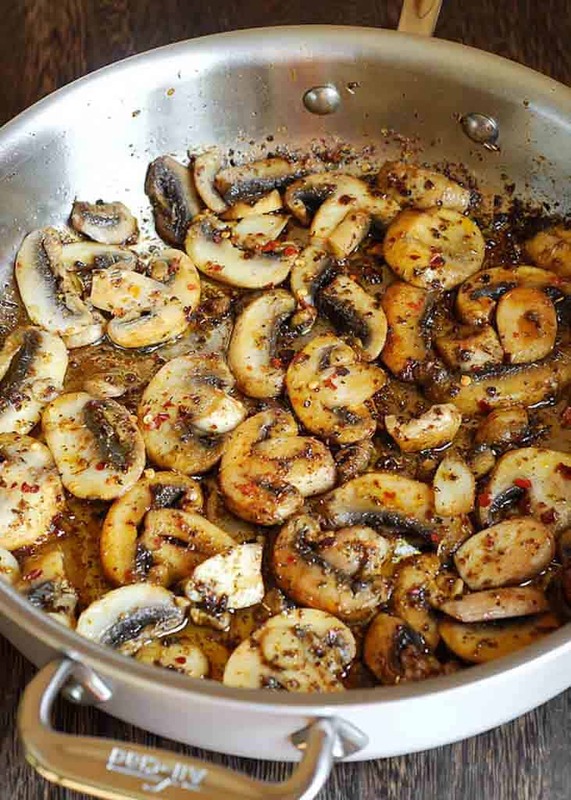 Once the pan is hot, add sliced mushrooms and 1/4 teaspoon of salt and cook, stirring, until mushrooms release liquid and reduce in volume and get soft, for about a minute or two. Add minced garlic for the last few minutes, when mushrooms are almost ready. Sauté for 1-2 minutes and then add back the cooked shrimp. Add pesto, stir, and then deglaze the pan with the white wine. Add the stock and allow to reduce, about 2 to 3 minutes. In the meantime, bring a large pot of water to boil, add pasta and cook it according to instructions. Drain the pasta, but do not rinse. Add pasta to the skillet and stir until pasta is fully coated in sauce. Allow to warm for 2 minutes, and then portion and serve. Season with more salt and additional red pepper flakes, if desired. Our new favorite pasta recipe is this Cajun Chicken and Sausage Penne Pasta dish! It’s so unbelievably good and I cannot recommend it enough! And how about coking with red wine? Aloha! Your recipe looks delish but I thought you might like to know, with all the ads and pop ups, your blog is next to impossible to read on my iPhone. That’s terrible. I just reduced the ads too! I’ll look into it again. Thank you. Very good dish. My friend who was eating it at the time asked when I was making it again. I do not do wine si I just increased the chicken stock. Thanks for a great recipe. I’m so glad it worked with just chicken stock! You can use a high quality vinegar instead (1/2 tablespoon to start with). Made this tonight using sun-dried tomato pesto because it’s what I had on hand, and it was delicious. Entire family, including kids, loved it. Delish. I am happy to hear you enjoyed it, Kelly, and I love when the entire family loves the dinner! Sun-dried tomato pesto sounds like a great idea. I might try that too. This dish is fabulous! My husband said it was the best dish I’ve ever cooked in a long time! Will definitely prepare again! I’m so glad you and your husband enjoyed it Teresa! Delicious!!!! Even my husband, who does not care for mushrooms, loved it. Will definitely be a repeat dinner at our house. Thank you so much for returning and leaving feedback. I’m glad you liked it enough to want to make it again! HI! Is there a recipe for basil pesto? Did I just miss it? No, you didn’t miss it. I used store bought pesto for this. I hope you enjoy it! Made this according to the recipe but added sliced red peppers, pieces of uncooked lobster tails, and red onions. It was simple, quick and delish! So pleased you enjoyed it Lucille! Addition of lobster tails makes it even better. We loved this dish! I did make my own twist to the recipe and add a little more olive oil, used porcini mushrooms and added a couple tablespoons of whipping cream which gave it a very rich flavour and still was a really nice mix with the spices. Definitely would make it again. Love hearing that you loved this as much as me. Forgot the mushrooms =( Wasn’t horrible. Would make again!! My family and I loved this dish. It was delicious and very easy to make. I”m glad that you found it easy! Pesto and skip the cooking wine. Wine can definitely be skipped. Does the red pesto you are using have sundried tomatoes in it? If it does, it will work great with shrimp.